Volkswagen becomes world No1 | What Car? Volkswagen yesterday became the worlds most valuable company but only for a short time. Frantic stock market trading saw VW shares peak at 1005 euros, which gave it a market value of 269bn euros (237bn). The increase in stock price was triggered on Sunday when Porsche revealed it owned, or had options to buy, more than 74% of Volkswagens shares. As a result, traders desperately tried to buy back shares they had previously short-sold. Short-selling involves traders borrowing shares, selling them at high prices, then buying back when the value falls. The trader then returns the stock to the owner and pockets the difference. 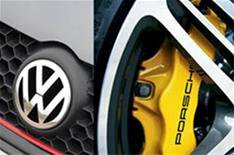 However, Porsches announcement raised the value of VW shares and at the same time left very few for desperate traders to buy back in order to close their positions and avoid huge losses. Afternoon trading saw the value of shares fall back to 686 euros, compared with a price of just below 200 euros last Friday.